See Santa Skate. See Santa Smile. See Santa snuggle his reindeer. A jolly Santa certainly brings a smile to anyone’s face. 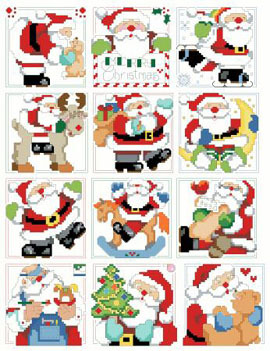 Twelve smiling Santas are here for you to stitch as ornaments or even greeting cards to send to a special loved one who needs a smile to brighten their day.